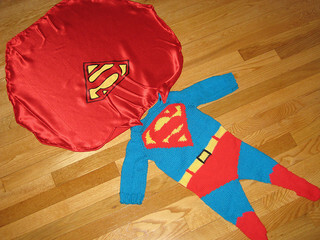 Those who follow me on Instagram/FB got a sneak peek at Henri’s Halloween costume this year. The boys fell hard into the world of Hogwarts when we began showing them the films this year, though we stopped after the 5th one because they were getting a bit too dark. Jakob wants to be Draco Malfoy. It was his original costume choice, now possibly swapped out for a Minecraft Enderman, but in general, he wants to be a Slytherin. He thinks Harry was put in the wrong house, and that Slytherin is where it’s at. It’s less to do with the negative traits or a penchant for the color green, than it is that, as he likes to remind me, “We love snakes, Mom.“. Yes. Yes we do. 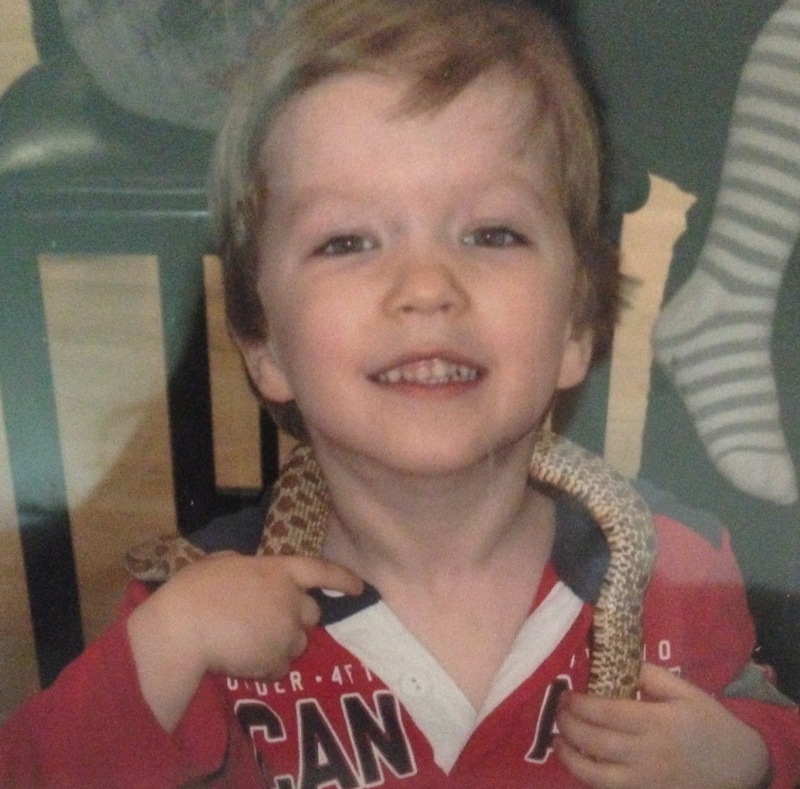 Jakob, age 4, with friend. The Snake is my Chinese sign and a long-favored creature of mine, and that love transferred down to my oldest. In fact, we’d have a pet snake at home if it weren’t for 2 things: 1. I would be too heartbroken to feed it mice, and 2. my father-in-law would never visit again. In any case, if ever he were to dress up as anything from the Potterverse, it would be in Slytherin colors. But Henri? He’s Gryffindor all the way. Doesn’t he even LOOK like a young Harry??? 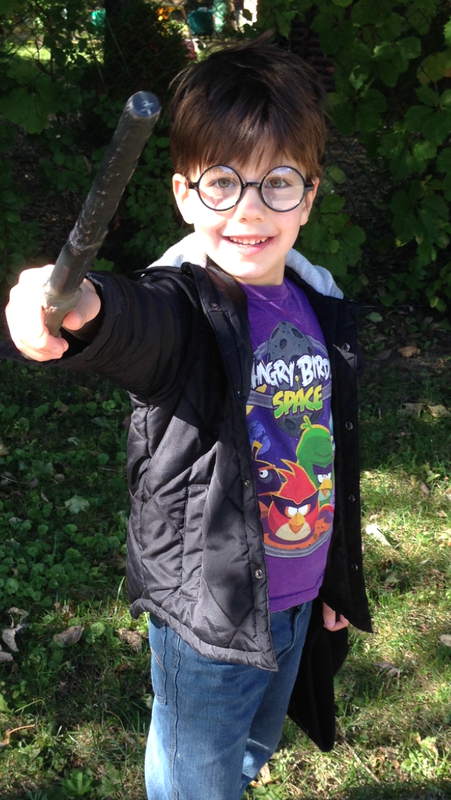 We bought those glasses and wand last weekend at the local Halloween store, and my mom lent us a black grad gown that is PERFECT for his robes. I’d like to find time to make a crest for the robe, but the main finishing touch for his costume is the scarf, so I decided to get on that last night. The burgundy isn’t quite right, but I’m working with stash yarn and I don’t think he’ll mind too much. The pattern is my own, such as it is. CO 30 sts with burg yarn. Work 1×1 rib for 30 rows. Change to yellow, work 1×1 rib for 30 rows. Repeat, ending after a burgundy section. Add fringe. UPDATE AFTER HALLOWEEN: Here’s Henri’s final costume! 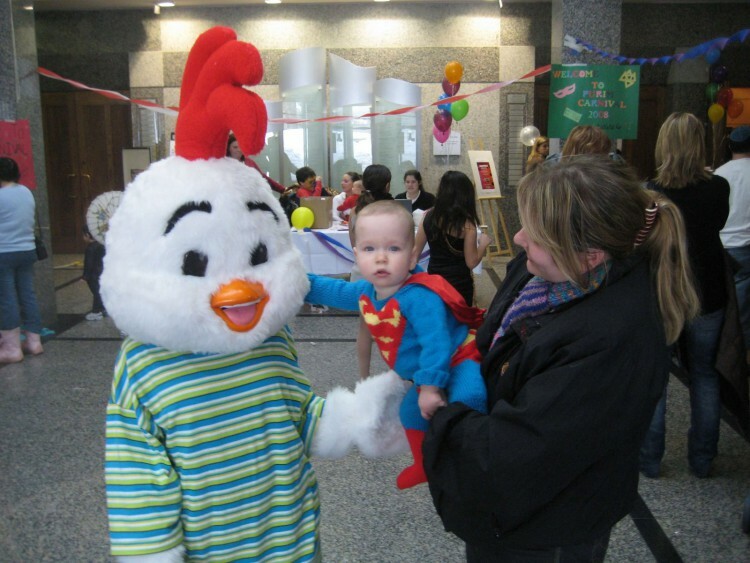 Categories: Family, Knitting, My Patterns | Tags: cosplay, costume, halloween, Harry Potter, snakes | Permalink. The boys keep talking about what they want to be for Halloween this year, and it has me reminiscing about Jakob’s first Halloween, and one of my very first designs. Here’s a repost, coming to you from all the way back in 2007. Lookit how wittle he was!! 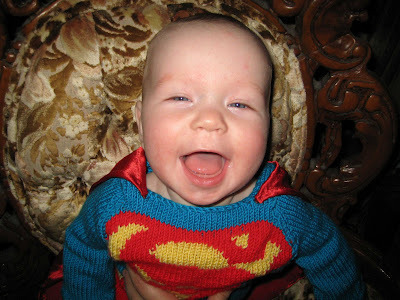 SuperBaby’s special powers include drowning his adversaries in massive amounts of drool, and the ability to shove anything into his mouth. Foes are often foiled in their plots by his awesome cuteness which requires all who pass to stop, come closer, and kiss him. 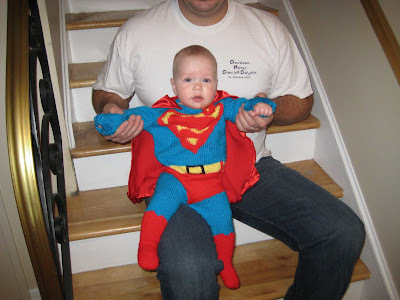 SuperBaby also managed to stand by himself (leaning on the sofa) for the purposes of taking this photo. His detachable cape is this season’s “in” accessory. 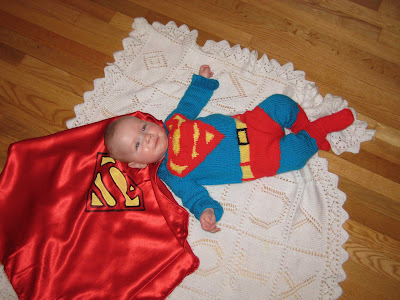 No SuperBaby would be caught dead without a cape this year, and we hear that shiny red is the new black. 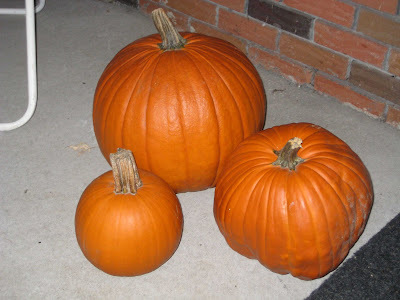 By the way, these are the pumpkins that Yannick bought for outside our house. Should I be insulted that the “Daddy” and “Baby” pumpkins are perfect, and the “Mommy” pumpkin is all lumpy and deformed? 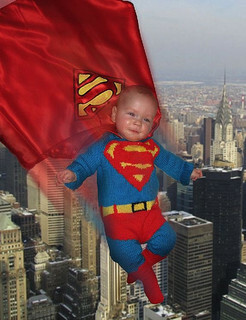 My brother Aaron edited that pic up there and now SuperBaby looks right at home, defending the city. 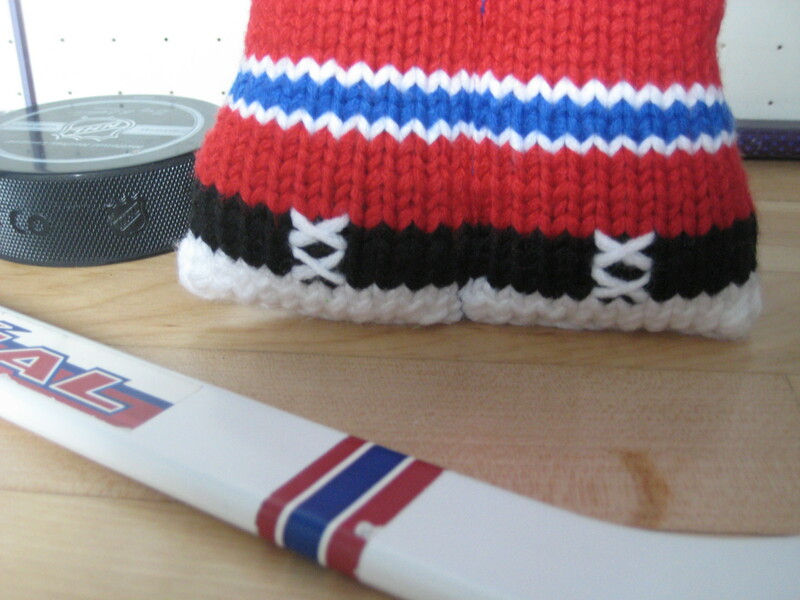 A little while later I’d contacted DC inquiring about permission to write up and publish the pattern. (They, duh, refused me). 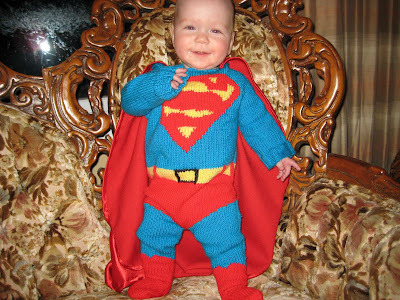 So… I modified it into a generic superhero instead, and now anyone who wants to can knit up their very own! The pattern is written for ages 6-12 months [12-18 months], and includes full instructions and charts for the costume, the two shown chest shields, and the cape. There is also a blank chart with instructions on how to design your own shield, in case you want to personalize it with your favorite SuperBaby’s initial. 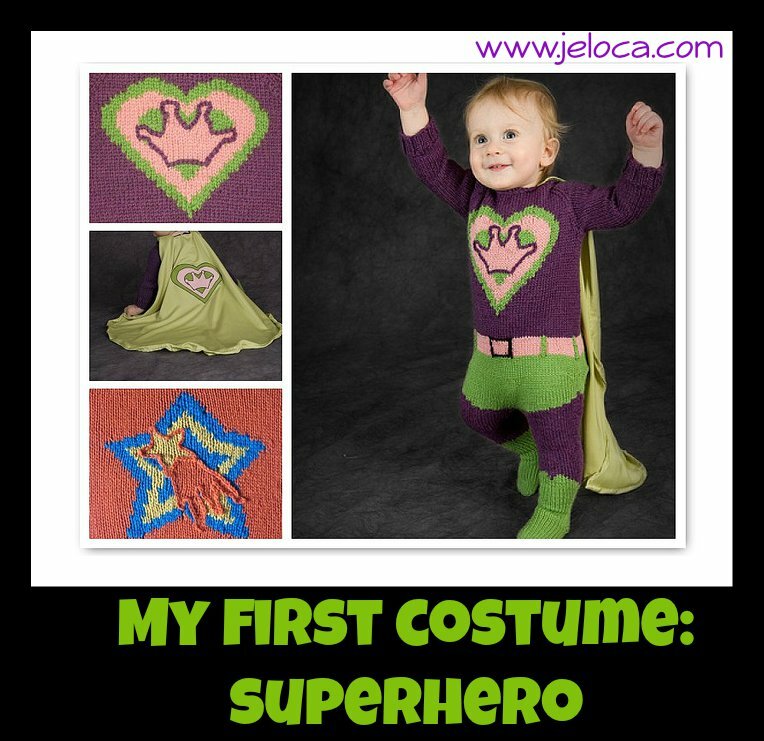 Categories: Baby, FO, Knitting, My Patterns | Tags: costume, halloween, my designs, My First Costume SuperHero, my published designs, Superhero | Permalink. NOTE: for some reason comments are closed for this post…I’m not sure why, but you can still reach me by email if you want. The pattern is $2.99 CAD and is available in Ravelry here, or to purchase directly click here. That link is for a Ravelry PDF download, but you don’t need to be a Ravelry member to purchase. I hope you enjoy it! I tried my best to make the pattern faithful to the red home uniform, and you can knit it with just stripes, or duplicate stitch/embroider the famous CH logo. There’s even room on the back to duplicate stitch your favorite player’s initials (and even his name, if you’re good at embroidery!). 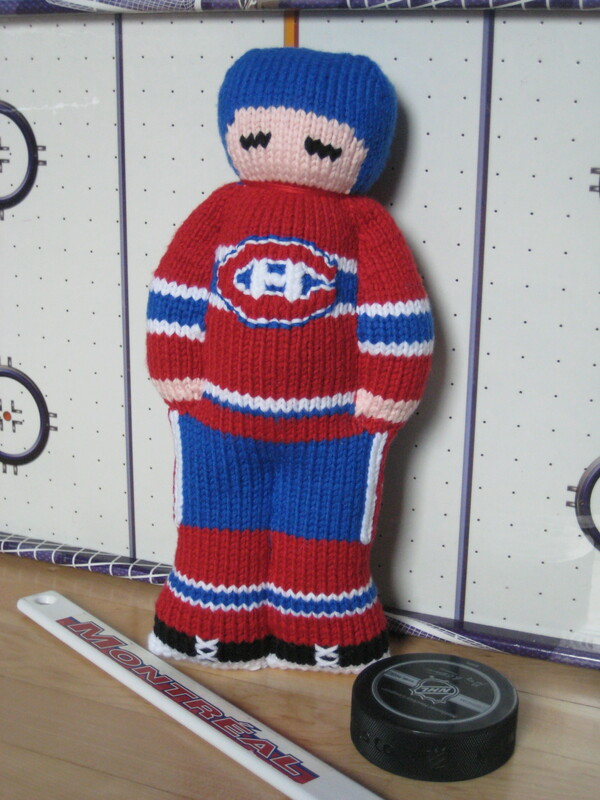 Categories: FO, Knitting, My Patterns, My Published Patterns | Tags: My First Hockey Player: Montreal Canadiens | Permalink. A while ago I had an idea for a new pattern. Actually, to be more specific, it’s a major modification using the basics of one of my existing patterns. Before I could cast on, I needed yarn. 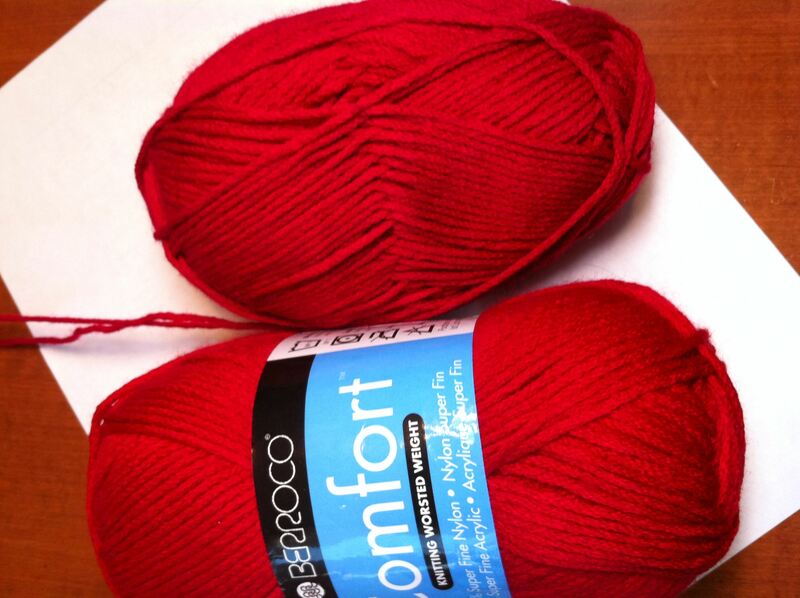 I need red, black, white, blue and cream yarn, in roughly a worsted weight. I didn’t think I had anything, until I remembered some Berocco Comfort DK I’ve had for a while now. Perfect! I printed out my chart, and last night while Yannick and I watched an episode of $h!t My Dad Says, I did a mini swatch. Hmm. The yarn calls for a 4mm, and I need a tighter gauge, so I swatched with 3.25s, but the fabric I got was still pretty open. I couldn’t find a 3mm (actually, I could barely find any needles- where are they??) so I figured I’d just get thicker yarn. The LYS didn’t have the right shade of red. 😦 They had crimson, fuchsia, raspberry, red wine, almost every possible pinkish tone of red that exists. But no RED, like a real, primary color red. 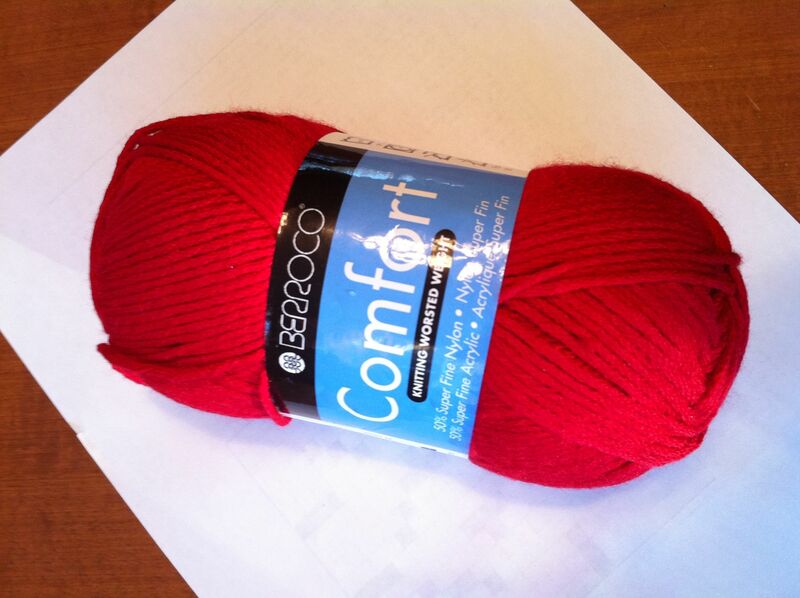 We started going through other possible options, and D, who works there, showed me the exact color red, in Berocco Comfort Worsted. Yeah, but, I told her, I tried swatching with that last night, and didn’t get a tight enough fabric. I stopped thinking about it, and kept looking around the store. I’m ashamed to say it actually took about 5 more minutes of discussion before I realized that I’d swatched with the yarn I own, which is Comfort DK. The yarn in the store was Comfort Worsted. Thicker. Duh. The LYS didn’t have the right shade of blue. 😦 They had denim, cornflower, dusty blue, almost every possible greenish or grayish tone of blue that exists. But no BLUE, like a real, primary color blue. I was about to give up and head to Zellers for some Red Heart Super Saver, just to get a chance to knit up a sample, when I had the bright idea of knitting with the DK I own, but held doubled. 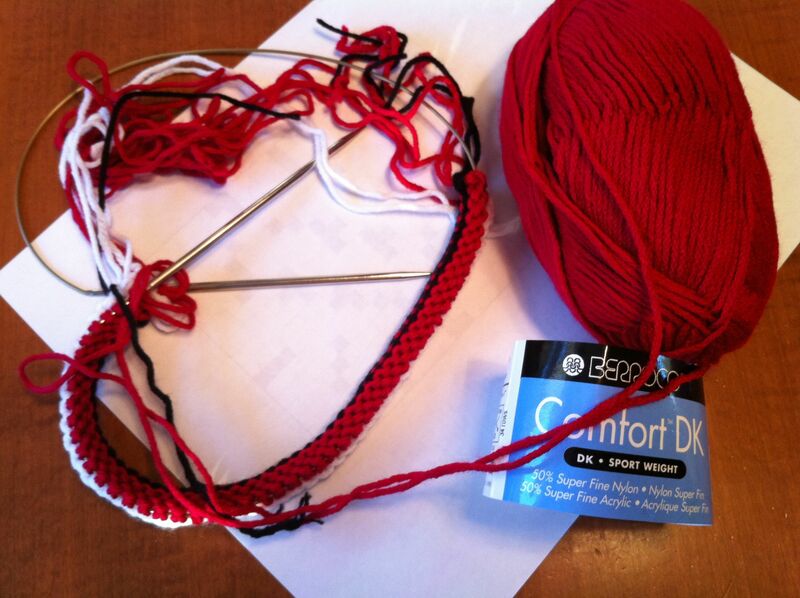 I had enough for my project, and it would obviously give me a thicker yarn…it just might work. I felt really guilty, though, at having taken up their time and having D run around to the back to look for the right shades of yarn for me, so I might have bought a ball of sock yarn. Look, Ma- it’s my very first Zauberball! I had to make a run out to the Children’s Hospital this afternoon to bring Henri’s doctor some recent videos, and when I finished there it was late enough that it didn’t make sense to head back to work, but early enough that I had about an hour to kill before picking up the kids. I came home and sat down to start working on the project with the Comfort DK doubled. I HAD an hour, but ended up with only about 20 minutes of knitting time. When I turned the TV on it was at the party scene in Batman & Robin (the Val Kilmer/Chris O’Donnell one) and man- that movie is like a car wreck or something- I didn’t want to watch but just couldn’t tear my eyes away. From Nicole Kidman’s non-moving face to Jim Carey and Tommy Lee Jones’ over the top villians…wow. Just wow. I started with the white, and a 3.5mm needle. So far so good. I moved on to the black; still working great. Then I threw in some red and came to a screeching halt. My red wasn’t red. I thought it was red, but it wasn’t red. It was very-dark-almost-red-but-just-a-little-too-pink-to-be-actual-red red. That sucked. Not sure how well the color came out via cell phone camera, but it’s like faux red. It’s like almost, but not quite, entirely unlike red. But there was a solution to be had, and I still had enough time to carry it out. My LYS still had that ball of Comfort Worsted in The Right Red. Or rather, they had had it. I have it now. So here’s where it begins. 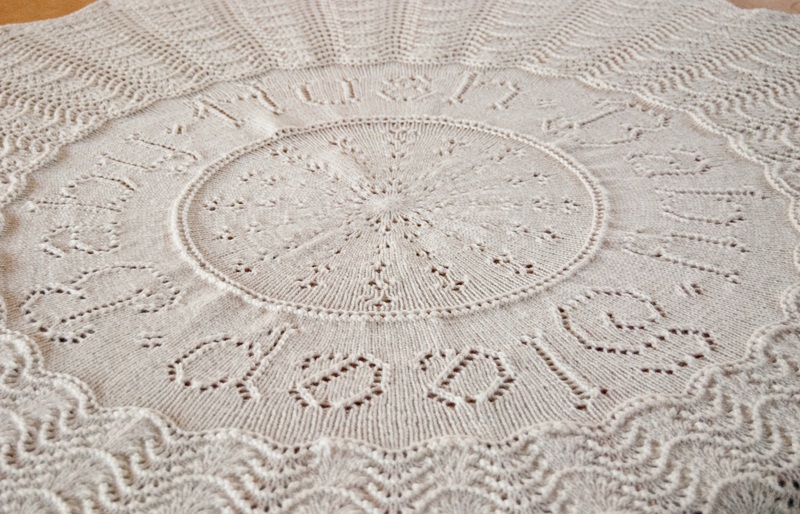 You take the pattern, you take the yarn, you take the needles, and there you have…the facts of li- whoops. Hehe. Sorry. It’s been a long day. I’m going to go take the edge of by knitting. Do you ever need to squeeze in a few rows just to get through a rough patch? Categories: My Patterns, WIP | Permalink. Last Wednesday (last week) was boring- I slept most of the day, then hung out with Yannick and watched TV at night. This past Wednesday (yesterday) was boring- I worked most of the day, then hung out with Yannick and watched TV at night. Nothing more to say about the Wednesdays. Last Thursday (last week) I met with my surgeon for the ultrasound results. The good news: I’m cleared for surgery! My rectus muscles on both sides of the abdomen are bruised, but that will go away with time, and there’s nothing to do for it, and no reason not to get this hernia fixed once and for all. We’ve rescheduled it for April 4th, which was both the first available date, but also far enough away for any swelling to go down. That delays me by about a month, but at least that’s all it is. I always leave the surgeon’s office feeling beat up, what with all the pushing and poking he needs to do to feel his way around my belly, so I went back home and took a nap until it was time to pick up the kids. As for this Thursday (today), nothing special’s going on. My mom picked the kids up from daycare and we got to hear all about Jakob’s trip to the Cabane à Sucre (sugar shack). My aunt (who I knit the hat for) is in town, and came by to visit with her foster daughter. 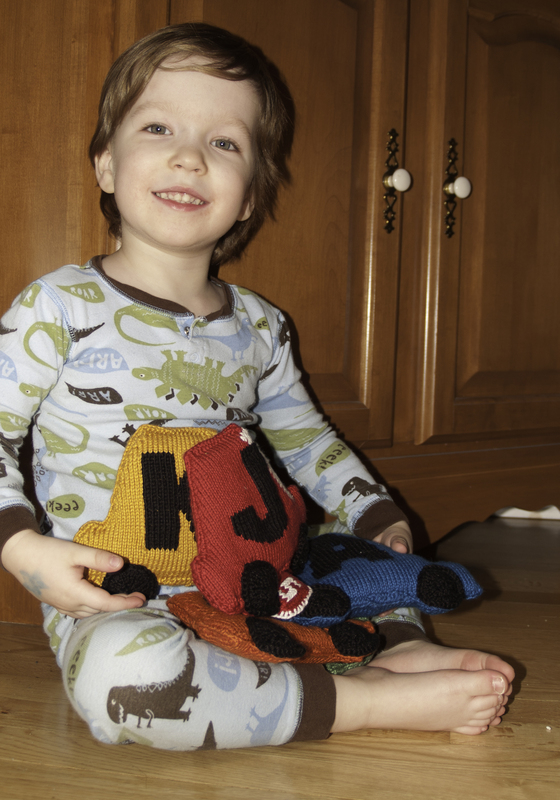 And now the boys are in bed and I can finally get a chance to share my latest pattern with you! 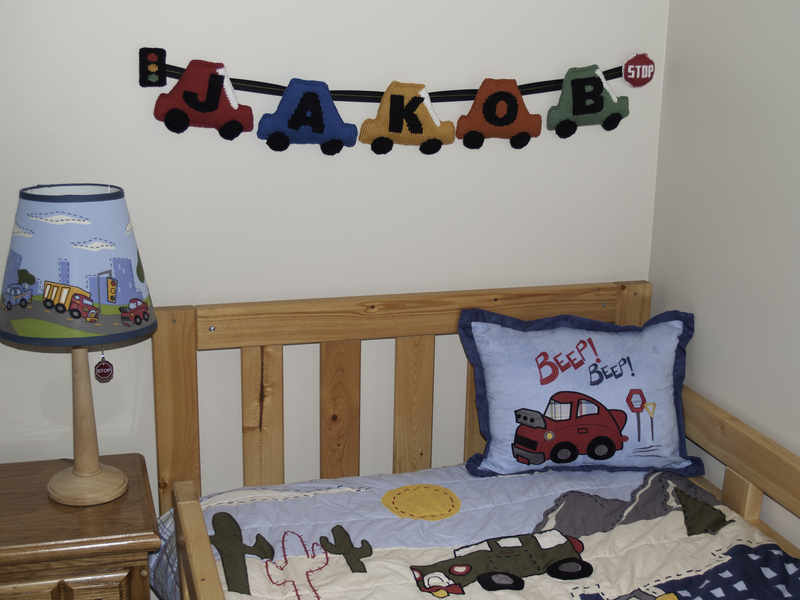 This pattern is a great way to dress up a child’s bedroom or playroom with a fun, personalized touch. 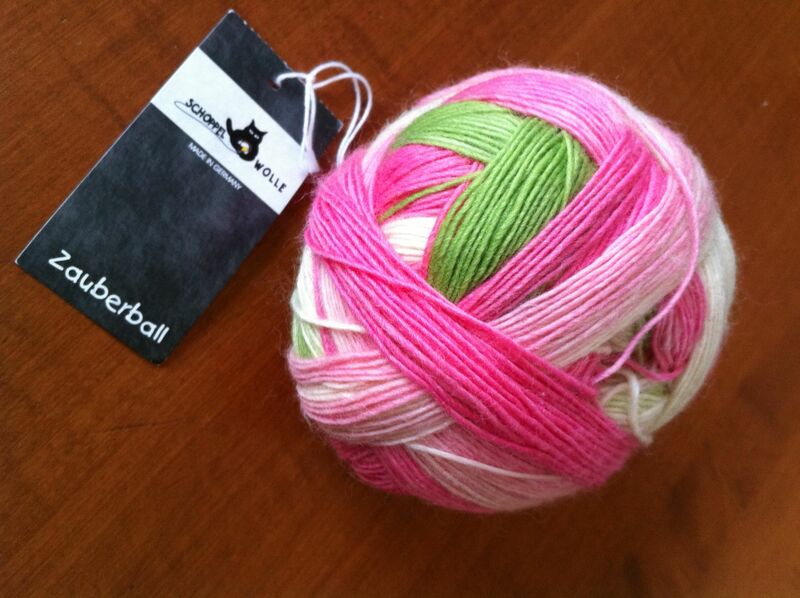 It takes less then a ball of yarn per car, and you have the option of making them with or without windshields. The pattern is available through Ravelry (even for non-members). More information here (my site) or here (Ravelry page), and also through Knit Pick’s site here, where you can put the pattern together with yarn to make your own customized kit. I hope you like it! A girls’ version is coming soon! Categories: My Patterns, My Published Patterns | Tags: My First Personalized Pennants: Cars | Permalink. I know this was officially published last Summer, but for those of you having a hard time finding a copy of the Spring/Summer 2010 St-Denis magazine, I am now able to get you the pattern directly! The pattern is available through Ravelry (even for non-members). More information here (my site) or here (Ravelry page). On a separate note, I’ve was home all last week with a sick Henri, so have got NO knitting and NO studying to show for my time. He had a double ear infection – I know, AGAIN. He just had a double on Jan 4th, after having a single on Dec 17th. 😦 Anyways, he also had a small infection in his lungs, not quite a pneumonia, but a little bit, and a TON of phlegm with a deep hacking cough. So though he missed the official PJ day at school, we had a PJ week at home together. I spent every nap time and bed time working on my KP pattern (that I feel like I’ve been talking about forever…though it’s “only” since last Summer). I’m almost done! The pattern itself is all typed up and set into my pattern template, all the notions and details and instructions and such all properly laid out. All that’s missing is to work up some charts in Knit Visualizer (‘cus it imports looking better than my working charts in Excel) and it will be done! I’ll mail the finished sample off to Knit Picks and then it will be out of my hands. I’m really glad it looks like I’ll be true to my plan of getting it mailed off before my surgery. Categories: My Patterns, My Published Patterns | Tags: Lullaby Blanket | Permalink.